Its been a wonderful day of baby bliss and cooking – it was rainy outside today, so we had soup for lunch – a gorgeous mixed vegetable soup – butternut, asparagus, carrot, tomato, and green bean, simmered lightly, and then blitzed in the blender. And with it, four cheese grilled cheese sandwiches, on gorgeous brown bread, with a smear of mayo and mustard. Four cheese might sound overwhelming, but it really isnt if you use only little bits. I used all four because I was trying to use up ends of cheese – so we had brie, with the rinds cut off, which made the sandwiches silky and melty smooth, parmesan for its nuttiness, cheddar for its cheesy-ness, and Laughing Cow, because it was there! A little salt and pepper, and grilled them over a slow fire. Delicious. For dinner, an angel hair pasta with spinach, zucchini, tomato, mushrooms, sliced garlic, white wine and sour cream. And for dessert, an apple berry crumble made with literally a handful of berries left over from a berry fest, and some gorgeous Braeburn apples. 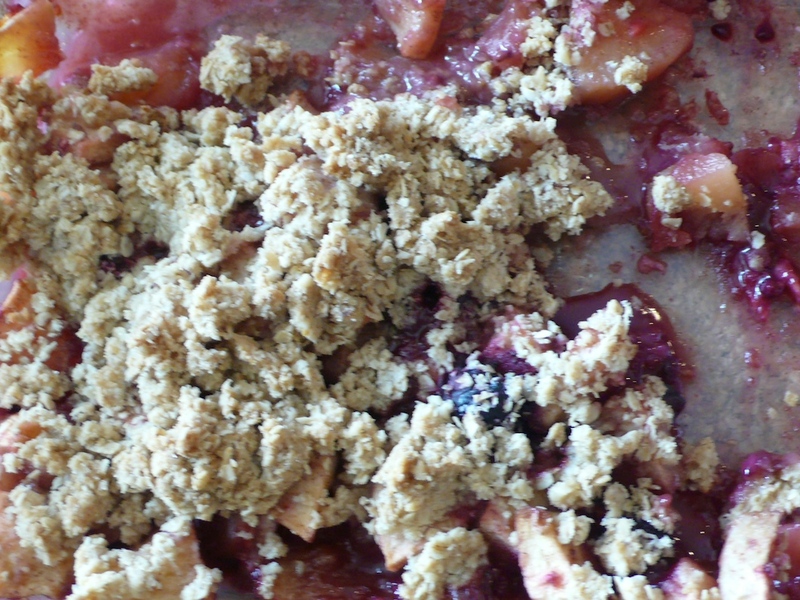 The berries tinged the apples red, and added a sweet berry tartness to the crumble. Perfection. Peel, core and chop the apples, and place them in a glass or metal baking pan. You can use a pie pan but I like those smallish rectangular pans. Sprinkle lemon juice over. Mix in the berries, with your hand or a spoon, making sure that the berries are completely mixed up with the apples. Sprinkle over 2 tsp light brown sugar (or more if your apples arent that sweet), 1 tsp cinnamon, and 1 tbsp flour. Again using your hands or a spoon, mix well. The flour will thicken the juices of the apples and berries as they cook so you have a thick luscious crumble, instead of a juicy wet one! Ensure that the berry apple mixture is arranged in an even layer in the baking pan. 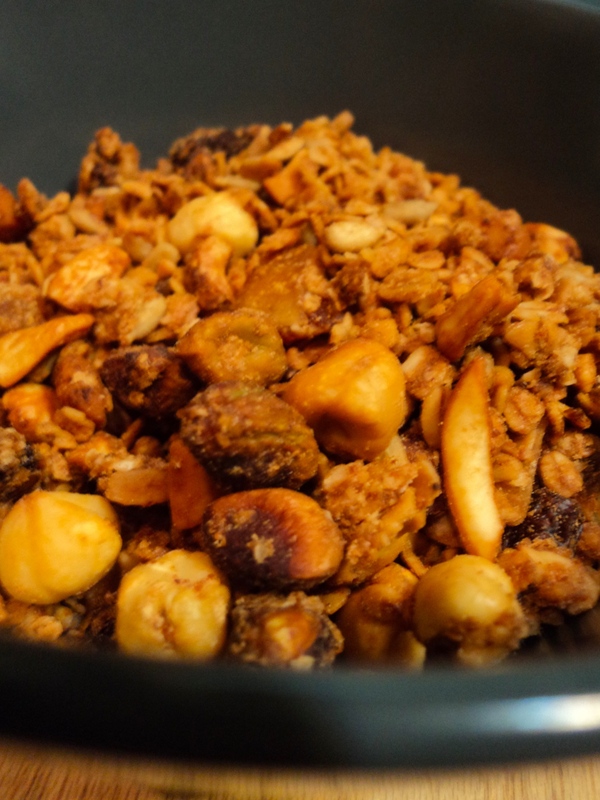 In a small bowl, mix together 1 tbsp sugar, 2 tsp cinnamon, the oats, grated butter, and salt. Using your fingers, work the butter into the oats. The mixture will resemble sandy gravel. This is what you want. Taste – if it needs more cinnamon, more sugar, more butter, add. Sprinkle the crumble mixture over the apple berry mixture, and bake in the oven for 45 minutes – 1 hour. Serve warm or cold.